An evening of Art, Music, and Ritual featuring; Hagen von Tulien, Kindle Cimmerian, Twilight Bellidanse, Dawn Von Nagy, Raqs Steady Eddie, Ariock Van de Voorde, Scarlet Marie and More! The 5th Annual “BLK Celebration” will be a semi-public event on September 16th at Edge of the Circle Books and will include events at the store from 6-9PM. 6:00-7:00PM – Meet and Greet and Book Signing. Open to public. A chance to converse and get some books/journals signed. Writers/Artist on hand will include Hagen von Tulien, Johnny Jakobsson, Dawn von Nagy, Ariock Van de Voorde and more. A VERY limited edition “BLK Celebration” print designed by Hagen will be made available. Wine and snacks will be served. 7:00-9:00PM – Ritual/Performance. Semi-Private. Invited guests may convene in the ritual chambers for an evening of evocative entertainment from Black Lotus Kult and Friends. Space is limited, and once invited guests are let in, we will allow additional attendees to enter as room permits. Performances will include the premier of a song from a Michael Bertiaux/Black Lotus Kult collaboration! 9:00-? – Carousing. Open to Public. After the performances are complete, we will head one door down to The Honey Hole (703 E Pike) for shenanigans. 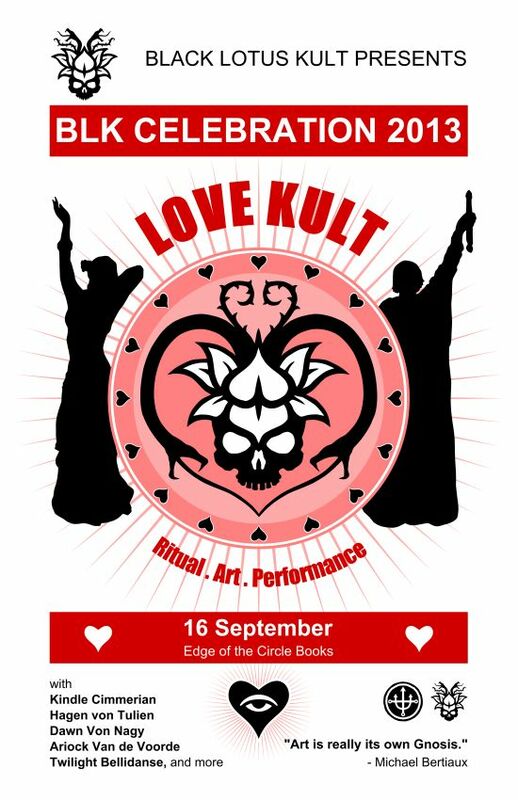 For those who can’t make it to the event, Black Lotus Kult is offering, via the BLK Library, a limited edition “BLK Celebration” print. Based on the design of Hagen von Tulien (SEE ABOVE) and incorporating the “BLK Love Kult” logo, these prints measure 11.25″ x 17.3″ and are printed on premium poster card stock. Each will be individually hand-numbered, and will include the BLK Library Stamp, a Black Lotus Kult Propaganda Decal and the signatures of Hagen and various other Black Lotus Kultist who are performing at the event. THERE ARE ONLY 20 OF THESE BEING PRINTED. Pre-orders start now and will be cut off the day before the event (Any remaining copies will be offered there. If you plan to attend and want a print, please consider pre-ordering in case of a sell-out). To reserve a copy and receive payment info, please send a message via the Black Lotus Kult or BLK Library Facebook pages. The price is $40 USD in the US and $50 USD outside of the US via Paypal. Price includes shipping costs. PLEASE NOTE that items will begin shipping the week of 30 September. A portion of the profits for every print sold will be donated to Seattle Humane (please let us know what name you would like to be added to the “Fundraising Honor Roll” at http://shs.convio.net/site/TR?px=1097302&fr_id=1090&pg=personal to mark your purchase and contribution to this great organization).